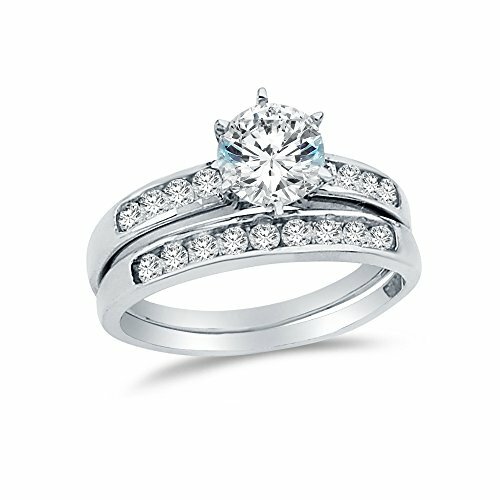 Solid 14k White Gold Round Cut Classic Channel Set Six Prong Bridal Set Includes Solitaire Engagement Ring with Matching Wedding Band Highest Quality CZ Cubic Zirconia (2.0cttw., 1.0ct. Center Stone). This brand new ring has a dazzling high polish finish. Made with the highest quality of craftsmanship and materials. Solid and pure 14k Gold, NOT plated. Authenticated with a 14k stamp. Order this absolutely stunning ring and we are confident that you will love it when you see it.